It's getting colder and colder as November plows on, so if someone could buy me this Hoodie so I could feel both worthy of the Klingon Empire and a bit warmer? That'd be great. 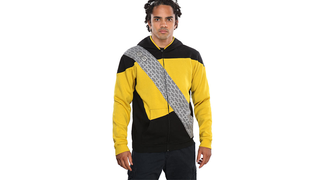 This lovely Hoodie, depicting Worf's TNG uniform as well as his baldric, is pretty nifty looking (although I guess the effect is lost if you unzip it), and lets you channel your inner Klingon as the days get darker and the cold winds rise. I mean, look how serious this dude is. That's some Klingon determination right there. In all honesty though, I think I would've liked it more if it was DS9-era Worf instead. You could've had a bit of material around the neck to replicate the division colour and everything! Also, because DS9 Worf was totally cooler than TNG Worf. He didn't get shot down so much, for starters. If you want one of your own, you can get it at ThinkGeek for $60. While you wait for it to arrive, you could knit yourself a Bat'leth scarf to go with it - and face winter like a True Klingon. Qapla'!